You'll always remember your first trip to the snow - the fun and amazement of a world so different to anything else. Mt Buller is the ideal destination being an easy three hour drive from Melbourne. You can be up here and enjoying our beautiful mountain Village in next to no time! There are a few things to be aware of when you're planning a trip to the snow, so we've put together the following information to make it as easy and enjoyable as possible. Click here to view an online version of our First Timer' Guide brochure! Get your visit off on the right foot by making sure you have the right clothing to keep you warm and dry. In the snow it's best to dress in layers to trap warm air and give you flexibility for changing conditions, with a waterproof outer layer to keep you dry. Waterproof pants and jackets are available for hire or purchase from a range of retail outlets in Mansfield and at Mt Buller. Don't forget a beanie or a helmet - it will keep your head warm and helmets are a smart choice to keep you safer on the slopes. Good gloves are also a must; it's hard to have a great time with frozen fingers! Please note that goggles, gloves and beanies cannot be hired due to hygeine reasons - you'll need to purchase before your trip or from one of the many outlets on the mountain. *All kids participating in any Ski & Snowboard School programs MUST wear a helmet. Play it safe and put "Lids on your Kids". If you are coming just for the day it's a good idea to bring a change of clothes for a comfy trip home. If you’re staying overnight we recommend bringing some sturdy boots for walking around the Village and winter woolies to keep you toasty as you head out to explore our nightlife. Mt Buller is an easy and scenic 3 hour drive from Melbourne, and there are a variety of options for getting here by coach, hire car, airport transfer and even helicopter! Check out the Getting Here section of the website. If you're driving to Mt Buller and staying overnight, you will need to carry wheel chains by law. If you're visiting for the day, you may or may not need to carry chains depending on snow and road conditions. The daily wheel chain declaration is made each afternoon and is communicated via a number of channels - click here to view the current wheel chain declaration. Driving in snowy and icy conditions can be very different to regular driving and therefore you need to adjust your driving to stay safe. Click here for a number of snow driving tips. Diesel fuel contains paraffin which can solidify in temperatures below 0 degrees Celsius. This can be prevented by filling your fuel tank with Alpine Diesel before you head up the mountain - available at most service stations in the alpine region. You'll know you're nearly at Mt Buller when you reach the Resort entry gates at Mirimbah, at the base of the mountain. Here you'll need to pay the resort entry fee, which is a levy set by the government that contributes to maintaining essential services within the Resort, including environmental management, snow clearing, water treatment, garbage collection, recycling and more. Click here for Resort Entry pricing and procedure. Once you're up on our beautiful Village, it's easy to get around. Everything is within walking distance, and there are free intra-Village shuttle buses that do regular loops around the Village on three colour-coded routes. The shuttle bus from the car park will drop you right to the Village Square where you will find all you need before heading to the slopes. The Village Square is the hub of Mt Buller featuring a great selection of clothing and equipment retailers, cafés and restaurants - all in one central location. There is also a supermarket, ATM and tourist information. Click here for plenty of information about the Village. Pick up your B-TAG lift and lesson passes at the Sale Yards Ticket office next to Cattleman's Café in the Village Square or up at the Ski & Snowboard School. You can skip the line altogether if you go online and pre-purchase your B-TAG, we can mail it to you. Click here for further information about booking lessons and lift passes. Experienced staff will help you choose and fit the gear you need and share helpful advice on everything from fitting skis, snowboards and boots to helping you find a good pair of gloves. It's easy to rent for the day and drop your gear back before you leave with most stores handy to the slopes. You can even purchase your lift B-TAG, lessons and other items in one simple transaction at Buller Sports outlets. Click here for a list of rental and retail outlets. Up the stairs above Buller Sports Central, you'll find the Blue Bullet Chairlift. This travels above Mt Buller's main beginner area, Bourke Street, and is the gateway to the Resort's upper slopes. Once you have your B-TAG pass, skis or a board you'll want to head to the Ski & Snowboard School. A lesson with our friendly team of instructors will have you making turns in style and is also a great way to learn your way around the slopes. There is plenty to at Mt Buller - on and off the slopes. On the snow, choose from skiing, snowboarding, tobogganing, sled dog tours and snowshoeing, whilst off the snow you can visit the day spa, catch a movie at the cinema, hit the indoor rock climbing wall, head out on the Gnome Roam and much more. Mt Buller has two designated toboggan areas - one located in the day car park next to Celia's Kiosk and the other next to Alpine Central in the Village. Please note that tobogganing is only permitted on the two designated areas. 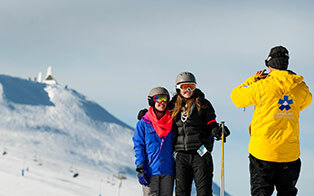 Click here for further information on all the activities on Mt Buller. Mt Buller has a fantastic event calendar jam-packed with events ranging from film festivals, food and wine shows and live music to skiing and snowboarding competitions and much more. The snow is a lot of fun but there are a few things to know to get here safely and have a great time on the mountain. Make sure you check out the snow driving tips and the Safety on the Slopes page to ensure you stay safe on the road and on the slopes. The SnowSafe website is also a great resource for knowing what to be aware of when you visit an alpine area. Pets including dogs and cats are strictly prohibited here at Mt Buller. Please do not bring pets with you on your snow getaway as they will not be allowed past resort entry. For more information please refer to our environmental management page. 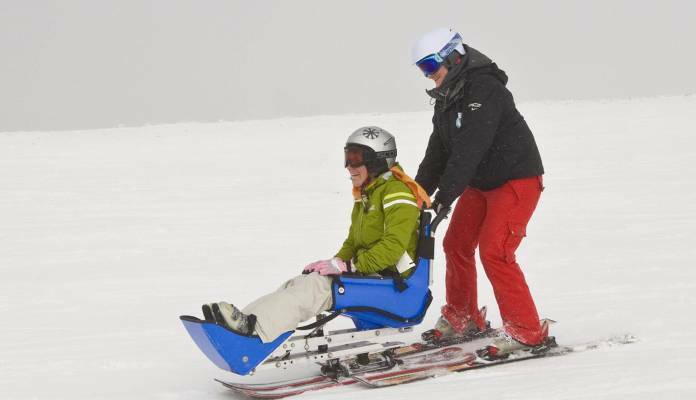 Mt Buller has facilities, services and processes in place to ensure access for all abilities.